I just spent a few days in Southern California on business and took a day to host a client for golf. 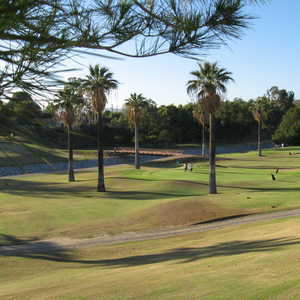 I stayed in a hotel in Long Beach and found a really interestingly designed golf course in Fullerton, just a 25 minute drive away. "Some of the tees are so elevated, you get some really wild views of the hole below and surrounding areas," Elliot DeBear writes. Golf course review: Trump National L.A. The course is Coyote Hills Golf Course, designed by Cal Olson and Payne Stewart. There is a nice bronze statue of Payne right by the bag drop. Coyote Hills is a certified Audubon Cooperative Sanctuary and carries a Golf Digest 4-star rating. The course carries a 72.2/135 slope rating and feels like a 149 when traversing the cart paths and streams from the tees to the fairways. Some of the tees are so elevated, you get some really wild views of the hole below and surrounding areas. There are actually a bunch of small oil derricks on the golf course that look like large children's toys. What I really liked about Coyote Hills is that the 6,510 yards from the tips felt legitimate all the way, each green was beautifully framed with soft evergreens and slopes, so it felt like you were hitting into kind of a crater setting, and the greens were in great shape. A round with cart cost $100. The place was empty this day, so we finished in three hours and change. We went for the $25 replay and played until the sun went down. It was very reasonable. Lunch was good as well. 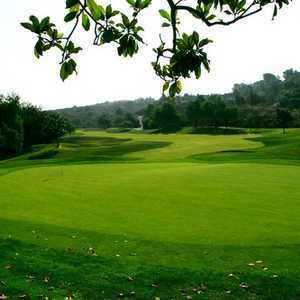 If you are in the Los Angeles area and seek a golf course that is fun to play and a great price alternative to the $250-$350 greens fees you will have to fork up for the Laguna tracks, this is a good deal.